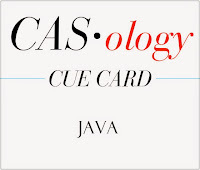 This week's CASology Cue Card is Java! This week is extra exciting because my daughter, Kate is Guest Designer. The only problem is that neither Kate (she's 11) nor I drink coffee. We don't really 'get' coffee. So we were a bit stuck. And I have a confession, I think in the end Kate made a more 'Ardyth' card than I did for this one! I decided to strengthen my 'java' message by using coffee colours - espresso, latte (ok, it's kraft) and cream. I paper-pieced the holder on my cup. Both stamps are from an old Hero Arts set. I don't know you made a pretty convincing coffee card;) I love the offset design Ardyth! You don't drink coffee?! Wow! This is the perfect coffee card, though, for someone who isn't a fan! If you hadn't told us otherwise, I'd say, gauging by your amazing card, that you're full-fledged coffee drinker! Love this!! Ardyth, you and Kate both did a great job for not drinking coffee! I love this older Hero Arts set...your coffee actually looks piping hot and strong! Well done! I would have never known you nor your daughter don't drink coffee...This is perfect! Love it! I love the offset stamping and the broad frame !! Wonderful way to use a large stamp and make it not so immense, wonderfully done!!! Perfection Ardyth. Love the partial image. The bold espresso colored border really caught my attention and I LOVE the sentiment. Terrific JAVA card! Your coffee card looks very inviting! I love that the sentiment reads what's perking and that your cup is just peeking from the edge! Wonderful and clever design Ardyth!